Ed Sheeran touches down in Toronto for a double date with Snow Patrol and Anne-Marie. Ed Sheeran�s heartfelt, musical, and beautiful songs appeal to fans of all ages around the world. Audiences turn out in the tens of thousands for Ed Sheeran concerts! Ed Sheeran tickets for his latest concert tour sold out the world�s largest venues in no time, even prompting additional dates to be added. Ed Sheeran is coming to Rogers Centre August 30th AND 31st! 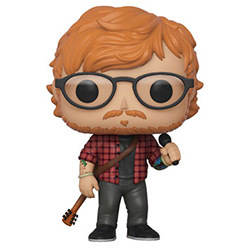 Get ready for the hottest concert of the summer, by picking up your own Ed Sheeran Funko POP!